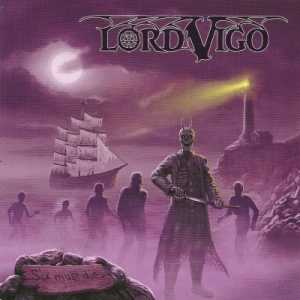 Lord Vigo's latest moves away from their Epic Doom beginnings to a more generic '80s Metal sound. Lord Vigo was the main antagonist of the second Ghostbusters film. Unlike the film, however, these guys are "...fraid of some ghosts". I knew this wasn't doom within the first few seconds of the first song. Really what we have here is traditional Metal that lacks anything to make it standout. All the songs are uptempo headbanging anthems to ghosts, I guess. When I got this CD, there was a note from the label claiming it was for fans of Candlemass and St. Vitus and I couldn't disagree more. This is just traditional Metal without solos. Even if you examine this through the most liberal of lenses there isn't much Doom metal present. This album screams '80s, and not just in a metallic sense. The production, the riffs, the vocals, etc... it really isn't a bad recording, but there's a lot of this stuff lying around. Let it said that there's nothing wrong with a few bands flying the flag of old school metal. A few bands. What we have is an overabundance of clones dedicated to Iron Maiden, Helloween, Slayer and so on. Lord Vigo isn't a standout in any sense of the word. On the plus side, the guitars are heavy and the melodies are plentiful. The drums sound pretty good as well. The vocals are a bit of a misfire as singer Vinz Clortho is limited in range and not very sharp when he manages to hit higher notes. In fact he frequently comes across as a more whiny Robert Smith (The Cure) than, say, Messiah. Really, this whole album brings Iron Maiden to mind, with the band's frequently used guitar harmonies, and perhaps a smattering of various Swedish Folk Metal acts with their various Nordic riffs. At the end of the day, I'm not overly impressed with what this Germanic trio has produced. Perhaps their first recordings are Doom metal but this certainly isn't. At least this band isn't one of the countless '70s retro-Rock acts that are not only erroneously mislabeled as Doom but as Metal in general. If you're into generic Power Metal with a penchant for pirate-themed albums, this is for you. Visit the Lord Vigo bandpage.